Three Redshank, three Common Terns, and Common Sandpiper and a Little Egret were seen today. A Redshank, a first-summer Mediterranean Gull and a Common Sandpiper were on the main dam today (no sign there of the female RCP), a Little Egret and two Common Terns were at Stratford. 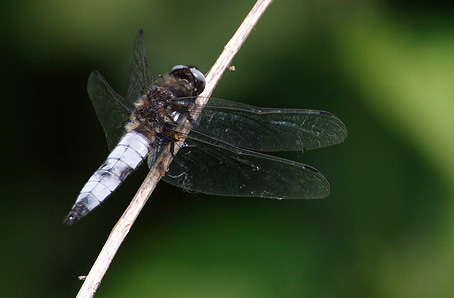 Although Scarce Chaser breeds on the River Chew near Chew Magna, until now there has only been one record at the lake. This afternoon one was seen on the River between the dam and the pumping station; perhaps they are a little more regular here at this underwatched location than previously thought? Scarce Chaser - Pumping Station. The female Red-crested Pochard was still present at the dam overspill today, two Common Terns were in Stratford Bay and what appears to be a Todd's Canada Goose was among the moulting flock of Canada Geese. A female Red-crested Pochard was seen at Whalley Bank today, with a Common Tern and a Goldeneye on the main lake. Ten Black-tailed Godwits and two female Goldeneye were on Herriott's Pool this evening, and a Common Tern was seen in Stratford Bay. The recent dryness has brought about a steady drop in the water level over the last few weeks. There were still two Black-tailed Godwits at Herriott's Pool today, and two Little Egrets at Heron's Green. A Brown Argus at Moreton was the first to be reported at Chew for a few years. Two Goldeneye, three Black-tailed Godwits and a Little Egret were at Herriott's Pool this morning. A few signs of early return passage today with five Black-tailed Godwits, one Curlew, one Little Ringed Plover and half a dozen Lapwing. Three Black-tailed Godwits were on Herriott's Pool this afternoon, and a Little Egret and a Hobby were at Heron's Green. Single Common Tern, Barn Owl and Kingfisher today, with a male aythya hybrid as well. The male Ferruginous Duck was at Herriott's Pool this morning, and a Hobby was seen at Moreton. An Oystercatcher was seen at Nunnery Point today. Two Sandwich Terns were seen over the main dam at 13:30. I've been asked to bring to your attention the efforts being made to halt the decline of the White-clawed Crayfish, which is being battered by competition and disease carried by introduced Signal Crayfish. Please have a look at this link to the new Bristol Zoo website, or you can download the pdf for further information. 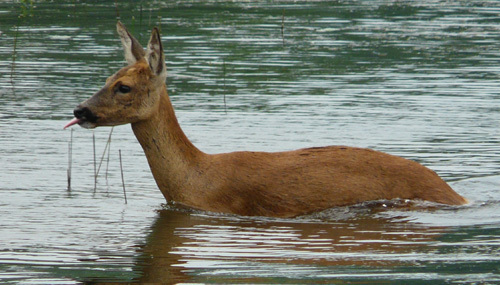 Please heed the advice if you happen to find yourself bowling about in lakes, streams or any other waterbodies. The Ferruginous Duck was again in Stratford Bay, a Little Egret was at Herriott's Pool, and a Barn Owl was seen hunting at Moreton this morning. 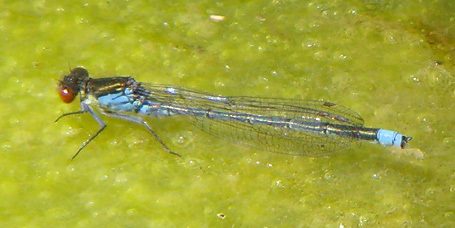 Red-eyed Damselflies appear to be spreading, with individuals being seen at Moreton and Stratford, and further reports from Blagdon Lake as well. A female Red-crested Pochard and the male Ferruginous Duck were on Herriott's Pool today. A Little Egret was seen in Heron's Green Bay again today. The decent(ish) weather was good for insects today, with a Painted Lady at Nunnery Point, along with three Broad-bodied Chasers, a Four-spotted Chaser, an Emperor and half-a-dozen or so Red-eyed Damselflies. The pond at Woodford Bank also had a Red-eyed Damselfly, along with another five Broad-bodied Chasers. Six Obscure Wainscots, two Silky Wainscots and Chew's first Adela cuprella (a longhorn moth) were trapped overnight. A Little Egret and the Ferruginous Duck were both still present, and a Cuckoo was heard singing at Herriott's Bridge early this morning. A moth trap run overnight produced four Pine Shoot Moths - evidently the first record at Chew. Full list here. Some of the more eagle-eyed of you may have noticed that a number of Swift nestboxes were installed of the valve tower at the main dam last year. Chris Klee is keen to hear from anyone who sees Swifts around the boxes (there is a recording of Swift calls being played on a loop in the mornings and evenings at the moment), so if anyone sees any Swifts taking the faintest bit of interest, Chris would like to hear from you. Please either let Bob Handford know at Woodford Lodge, or drop me an email and I will pass it on. Thanks! The male Ferruginous Duck was in Stratford Bay this evening, and a Dunlin was on the embankment at Heron's Green Bay. 27 Red-eyed Damselflies were seen at Nunnery Point today. One of the Red-eyed Damselflies at Nunnery Point (Andy Davis). A Honey Buzzard was seen by one lucky observer this afternoon, drifting low over Herriott's Pool at 15:45, then being lost to view over Burledge Hill. There are three previous records for Chew.